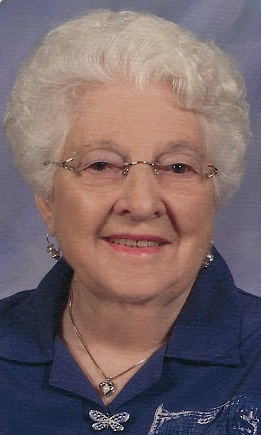 Marcella P. Becker, 98, of Oelwein passed away on Thursday January 17, 2019 at Mercy Living Plus in Oelwein. Visitation will be from 4:00 to 7:00 pm on Thursday, January 24, 2019 at the Geilenfeld Funeral Home in Oelwein where there will be a Catholic Daughters of America Rosary at 3:45 pm. Funeral services will begin at 11:00 am on Friday January 25 at Sacred Heart Catholic Church in Oelwein. Interment will be at the Woodlawn Cemetery in Oelwein. A memorial fund has been established. Marcella was born October 28, 1920 in New Richland, Minnesota the daughter of Michael H. and Josephine C. (Weber) Weydert. She graduated from the New Richard High School in 1938. Right after high school she worked for WPA in Minnesota. On April 13, 1941 she was united in marriage to Armin A. Becker in Estherville, Iowa. After her marriage Marcella worked as a telephone operator and in 1953 they moved to Oelwein. She was a legal secretary for M. S. O’Brien and later Ron VanVeldhuizen, retiring in 1982. While working as a secretary she was a member of BPW (Business Professional Women). She was a lifetime member of the Sacred Heart Catholic Church, Catholic Daughters of America, Sacred Heart Rosary Society and VFW Auxiliary. Marcella taught CCD for several years at Sacred Heart, enjoyed playing bridge (was still playing at age 92), painting china, poetry, traveling in Europe and winters in Arizona. People always commented what a lovely beautiful caring woman Marcella was and her white hair and kind smile. Marcella was a strong believer in her faith and taught it to her daughters. Marcella was a treasure to her family and friends. She will be dearly missed by all. She is survived by her three daughters, Victoria Huinker of Oelwein, Valerie (Doug) Schultz of Marshalltown and Virginia (Skip) Wallace of Boone; eight grandchildren, Todd Huinker (Carol Thomas), Terry (JoAnn) Huinker, Heather (Kevin) Crockett, Lindsay (Jared) Gulbranson, Chris Schultz (Jeni Viles), John Goodall (Beth Hines), Jacob (Kaycee) Goodall and Rachel Goodall; twenty-two great grandchildren; one great-great grandchild; and a brother, M. C. (Jeanie) Weydert of New Richland, Minnesota. She was preceded in death by her husband, Armin; two sisters, Irene (Jack) Veal and Beulah (James) Rhode, and her parents, Michael and Josephine. I am so sorry to hear of your moms passing, another beautiful rose in God's garden. I met Marcella in 1955 when Vicki joined my Girl Scout troop. She and Armin were always good helpers. I enjoyed my visit with here at Vicki's 70th B'day party, as well as your family. She will be greatly missed. Marcella was a wonderful example of a faith-filled woman. I will miss seeing her at Mass. Blessings to her family. She was a wonderful lady who raised three beautiful ladies. My heart and prayers go out to all of her family and friends.